What is blockchain, and what does it mean for fresh produce? In the age of big data, the Internet of Things (IoT), and the cloud, ways of conducting transactions in a verifiable and easy way are becoming more and more important. In 2008, the cryptocurrency Bitcoin was the first high-profile implementation of a distributed blockchain. Since then, blockchain has become a revolution in the way online transactions are carried out, and has rapidly been leveraged by other industries. In 2017, the Harvard Business Review stated that blockchain “has the potential to create new foundations for our economic and social systems”. While blockchain has become synonymous with Bitcoin for lot of people, it is important to stress that blockchain is an underlying core technology of Bitcoin, and that they are not the same thing. Bitcoin is only one of many, albeit the highest profile, implementations of a blockchain. So, if blockchain isn’t Bitcoin, what is it? A blockchain is, quite simply, a distributed ledger, or list, of transactions. 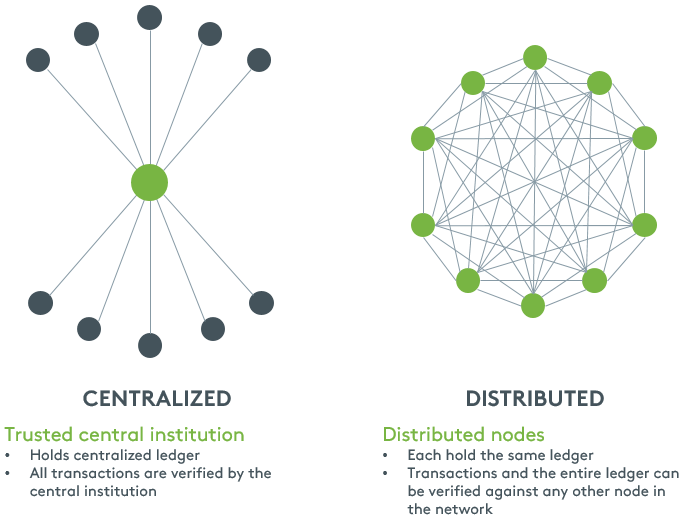 Instead of a single “trusted” institution (like a bank) holding the list of transactions, the list is distributed with a way to easily verify that all ledgers are the same. This allows industries without a central trusted repository of information to have a ledger of transactions that everyone can agree on, without having to set up a central institution to hold this information. All users of the network can verify transactions by comparing their ledger against the others in the network. This means that any foul play would have to have the collusion of a majority of the network. It’s easy to be cynical about blockchain when you cannot see the way it is applicable in a given industry. Like any core technology, without a tangible application it could easily be seen as just another industry buzzword. For any food retailer, and particularly those selling fresh produce, there has been a drive for visibility across the entire supply chain so that when there are food safety issues, such as the recent salmonella outbreak in papayas imported into the US, every point where the relevant produce went through in the supply chain can be found and appropriate action taken. The longer this process takes, the worse the situation can get for all involved throughout the supply chain, including the end consumer. A single consolidated fresh produce blockchain with all players recording their transactions of fruit through the supply chain from gate-to-plate would allow this process of discovery to take a matter of seconds, instead of weeks of intensive work, shortening the lead-time for corrective measures to be taken. The distributed nature of a blockchain means the conversation can move towards actual food trust, as no single player can manipulate the data to change the origin on the produce. It is very likely blockchain will be the underlying technology for packhouse traceability, as its distributed nature is more likely to get the buy-in from multiple technology manufacturers. Once a single gate-to-plate blockchain exists, the opportunities for packhouses and growers to leverage the information are endless. If a retailer is unhappy with a order, or if they have positive feedback when the product exceeds expectations, being able to trace the produce back through the supply chain before it was packed allows for better collaboration on the supply chain influences that lead to the outcome and how to improve them. Repacking introduces further complexity into the traceability of produce, and as a repacker, a simplified blockchain to confirm the origin of fruit in a pack you are making will be very important. As fresh produce moves toward brands, there is an opening for those who can prove they have a transparent supply chain to leverage what this transparency can mean, such as demonstrable fair trade and country of origin. Read more: How can you ensure a packhouse is providing the most value to you as a grower? IBM are positioning themselves as the consolidator on a single fresh produce blockchain, forging a partnership with some of the leaders in food retail globally; Nestlé, Walmart, Costco, McCormick and Co., Tyson Foods and Golden State Foods, some leading fresh produce suppliers; Dole and Kroger, and working with universities such as Tsinghua University, Fordham University, University of Arkansas, University at Buffalo and University of British Columbia to fund research grants. The IBM blockchain is based on Hyperledger Fabric, a blockchain originally built by IBM and now run as a global collaboration by the Linux Foundation. Hyperledger is an “open source collaborative effort created to advance cross-industry blockchain technologies”. As an open-sourced initiative, there is significant room for involvement for all those who have stakes in the implementation of blockchain in the fresh produce industry, and therefore gives the IBM blockchain the best chance at succeeding to get the buy-in from many stakeholders in the industry. Walmart has already successfully trialed blockchain traceability in mangoes, with the time it takes to trace a mango back through the supply going from nearly a week, which is considered fast already, to 2 seconds. It was the success of this trial that has driven many others to join Walmart and IBM on the journey towards a single fresh produce blockchain. As a packhouse, what can I do? As a packhouse or grower, it will be important to work with companies that see the importance of traceability for fresh produce, and who want to rapidly innovate using technologies like blockchain. You must surround yourself and your organization with the right people who understand the technology and can help you implement it. Technologies like Spectrim and Inspectra2, that produce a large amount of data for each piece of fruit, will be key in the information gathering for fresh produce, and being able to store and track this information through Compac Sizer Software will help keep your brand promise and true traceability into the fresh produce supply chain. With the ever-growing expectation of the consumer on a transparent supply chain that guarantees food trust, the influencers in the fresh produce supply chain will have to rapidly innovate, and packhouses and growers that adopt a blockchain driven traceability will become the gold standard for innovation and food safety.